Something interesting happened in 2014. 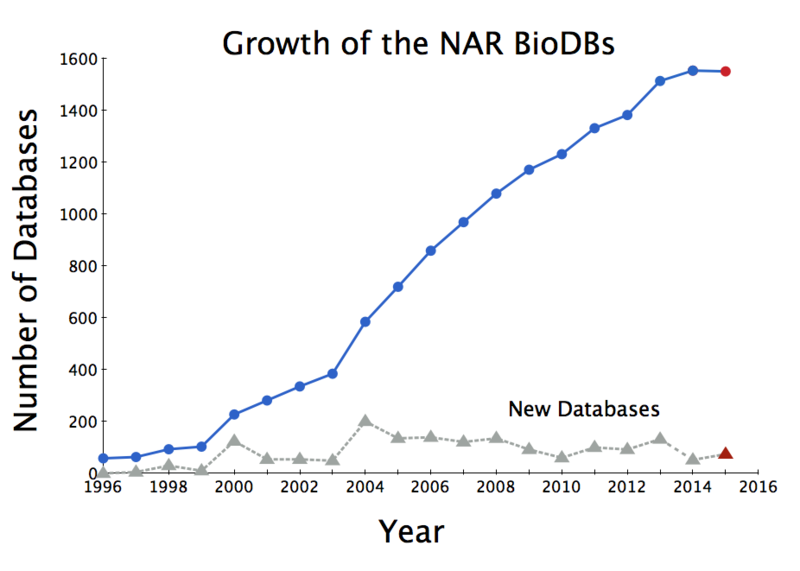 The total number of databases that Nucleic Acids Research (NAR) tracks dropped by three databases! What happened? Did people quit making databases? No. This year, the "dead" databases (links no longer valid) outnumber the new ones. To celebrate Digital World Biology's release of Molecule World I'll discuss some of the new structure databases below. But first, the numbers. As summarized in the database issue's introduction, Galperin, Rigden, and Fernández-Suárez tell us this year's issue has 172 papers. 56 of those describe new databases, 98 provide updates, and 17 are updates of databases that have been published elsewhere. Together the 56+17+1 other make 74 new entries in the NAR online Molecular Biology Database Collection. Removing 77 obsolete databases made this year's growth -3. The despair of riches The introduction paints an exciting picture of database development. We have updates of existing resources and new resources that can be used to advance multiple kinds of research. I share this view that new knowledge is created from new kinds of database and extensions of existing databases and am always excited to peruse the NAR database issue. But you do not need to peel the onion very far before you begin to cry. The challenges any user, other than a virtuoso data-miner of the resource at hand, encounters when trying to quickly assess the value of a resource is finding whether it is alive, is classified correctly, and lets you do things with the data other than browse information within the database's web site. A common tool to help someone evaluate a database's usefulness is an example of the data and a simple demonstration showing how the resource can be used. A short description of the resource's value on the web site also helps. As noted above, this year I wanted to find some data from a database, other that the RCSB Protein Databank (aka PDB) or the NCBI's MMDB (Molecular Modeling DataBase), that I could download and visualize in Molecule World. I excluded PDB and MMDB because I wanted to try something new. What did I learn? I followed the link from the introduction to the NAR Molecular Biology Database collection. 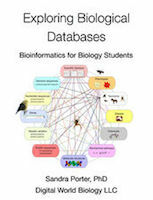 In this collection, databases can be accessed alphabetically, by category, or by other mechanisms. This is a browse and click experience. Unlike the databases it collects, the issue doesn't allow you to search the collection. Since I wanted to get some structures and look at them in Molecule World, I started with the Structure Database collection. Indeed, there are many databases in this collection. Structure databases are categorized as Small Molecule, Carbohydrate, Nucleic Acid Structure, and Protein. Structure PDB:1K0Z. Restriction enzyme PvuII showing that it is a dimer of two identical protein chains. 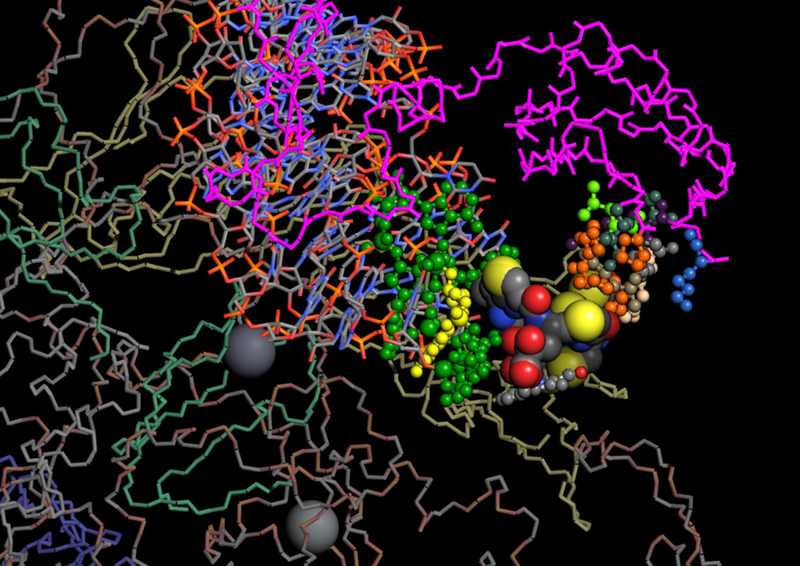 The protein backbones are shown with rainbow (amino to carboxyl, red to blue) coloring. The Pr atoms are shown as balls. Within each chain, the interacting residues are colored by element. At the top, there is the Bard (Bioassay reference database from the NIH Molecular Libraries program) database. It contains structures for 39MM chemicals (perhaps a subset of the 50MM chemicals in PubChem?). The Small Molecule, Carbohydrate, Nucleic Acid, and Protein groups hold 24, 12, 22, and 116 databases, respectively. All together that's 175 databases or greater than 10% of the entire collection. Let's go digging and see if we can find something cool. The search for interesting structures led me to structures with nucleic acids, proteins, and complexes. One of the databases that caught my eye was SCOR (structural classification of RNA). Unfortunately, the URL -http://scor.lbl.gov - takes you to a page you're not allowed to access. Maybe it's secret work that's been published for people to not use? How did the reviewers access this? Another possibly cool one would be Quadbase (G-quadraplex motifs in promoters) - it's URL (http://quadbase.igib.res.in) would not load a page. So far I'm 0 out of 2 just by clicking titles that look neat. Next, I tried NICR (Non-canonical interactions in RNA, http://prion.bchs.uh.edu/bp_type/). This isn't non-canonical, it's a loop. Every link takes you back to the original page with no obvious way to get to the database. We're 0 for 3. Did we strike out? Finding broken database links was NOT our goal. 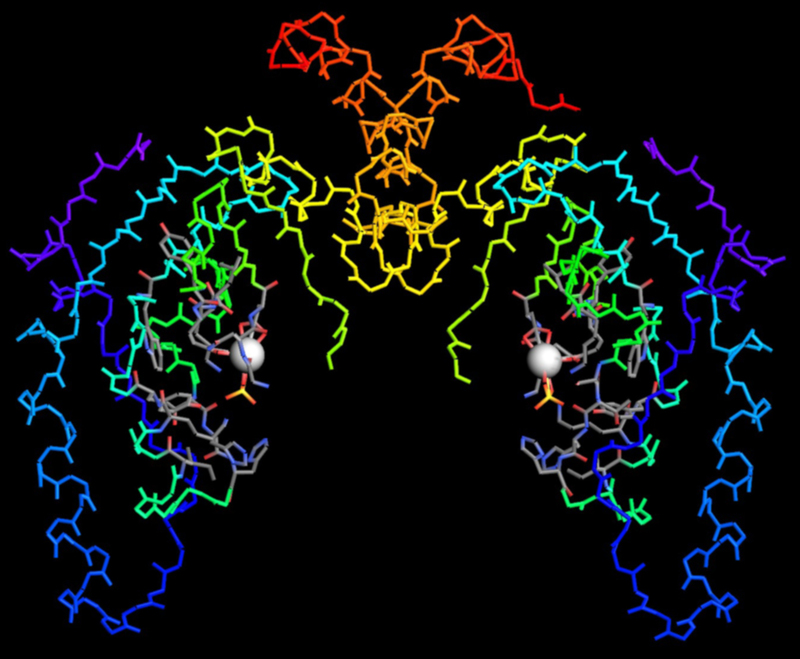 MetalPDB (http://metalweb.cerm.unifi.it), categorized under Nucleic Acids, is as the title suggests, a database of metal-binding sites in biological macromolecules. Although we found this listed in the Nucleic Acids category, the structures are mostly proteins. A great feature in this database is a very cool search tool. It's a periodic table with a radio button under each metal. Metals without corresponding PDB structures have with white symbols. The white chemicals provide a quick way to tell with metals are found in in structures and which are not (29 out of 84). Our own data suggest this is a little on the low side, but that's another story. I selected Pr (prasodymium) because, why not. 32 structures were returned, with the first in the list PDB:1K0z. This protein is the restriction enzyme PvuII from Proteus vulgaris. But here's where the experience moves from great to just OK. You can only work with structures within the website. Downloads? Make a small collection for a class? Sorry. You can't get there from here. Luckily, if I have a PDB ID, I know how to use it. With a quick search inside of Molecule World, I can get a structure from either the MMDB or PDB databases and make a fun picture. Ok, this database issue gets 1 point for mission accomplished (I found data, yeah! ), -0.1 for being misclassifying under nucleic acids, and -0.3 for not making the data easy to pull out. They get 0.6. That makes our cumulative score for today's adventure 0.6 out of 4. What's in the group of 116 databases under proteins? A lot of specialized things. My first try was 3D-Genomics. The link http://www.sbg.bio.ic.ac.uk/~3dgenomics/, returns, "The 3DGenomics server is no longer available." Again, seriously? It was then that I looked closely at the title of the NAR Molecular Biology Database Collection (category list page), is says "2014 NAR Database Summary Paper Category List." Did I get lost in the bowels of the NAR webpages? Going back to the top and rechecking the first link takes you to the top of to collection where this title says "2014 NAR Database Summary Paper Alphabetic List." That's right I got to the 2014 list from the 2015 introduction. Maybe it was random, bad luck chance that led me to stumble on 4 of the 77 obsolete databases in my first 5 attempts to find cool things other people are doing. Or maybe you really can't judge a book by its cover.